In mulling over and catching up on more prophetic words for the UK I’d invite you to weigh them with me. As I was waiting on God this morning the Lord gave me a vision. 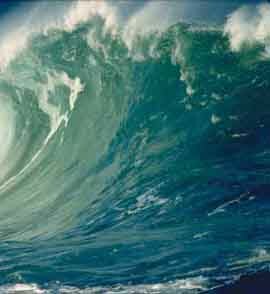 I saw waves heading towards the UK at speed their impact was imminent. The first was a wave of prayer. The second a wave or miracles and healing. The third was a wave of reformation – this wave swept across the nation and washed the nation clean to the point that it shone! However I saw a fourth contrary wave, it was coming to try to cut off what the Lord was planning, it was black and red and full of anger and violence. “Brace yourself and guard your heart for the enemy is about to reveal such wickedness it will shake you to your core, pray protection over the heart of my people for I cannot move in the midst of bitterness and unforgiveness. I was reading the Bible at home & was going to go through the book of Zechariah. And as I opened it up, so it was like a huge panoramic cinema screen in my front room. I couldn’t believe it. And right in the middle of the picture there was a huge F5 tornado going like anything. And I could hear it roaring. And then I could see a tsunami. And then the Lord showed me a picture of the whole of the UK, and the tornado went on its side, so you had the tsunami and the tornado just off Lands End ready to come over. And I said why Lord? and the Lord said they both represent My Spirit. The wind and the water both representing My Spirit, and the power of My Spirit. So then He started to take me through some scriptures. Zech 4:6 “This is the word of the Lord to Zerubbabel: Not by might not by power but by My Spirit says the Lord. He wants to do a tremendous work of God in the UK but it’s going to be by His Spirit. So He told me then to go to Zech 8. V 18-19 Then the word of the Lord of hosts came to me, saying, “Thus says the Lord of hosts: ‘the fast of the fourth month, the fast of the fifth, the fast of the seventh, and the fast of the tenth, shall be joy and gladness and cheerful feasts for the house of Judah’. You know really praising God and seeking after God. And so then the Lord was just showing me this picture of one Christian going to join another Christian. Groups of Christians going from one city to another city and linking together in real koinonia, real fellowship, real togetherness, crying out to God, praising God. And as that was happening, so the tornado started, first in Cornwall and all round that end and then right the way up through. As it was going up through, so the Lord really put the scripture on my heart, Zech 12:10, I will pour out on the house of David and on the inhabitants of Jerusalem the Spirit of grace and supplication. And it was ‘grace to it, grace to it.’ And then all of a sudden, in the picture I just heard Christians linking together, crying out, praising, but they were crying grace to it, grace to it, grace to it, to this tsunami, and this tornado, as it was going up, and then I heard voices from heaven saying ‘rolling prayer, rolling prayer, rolling prayer’. And then as they were saying that I saw a window opening in heaven and it was gradually going back further and further and further. And then I could hear voices from glory, with the glory of God shining down, upon the tornado and the tsunami. And I could hear ‘rolling prayer, grace to it’ over and over. And as the tsunami and the tornado were going over people, so they were being cleansed. They weren’t being harmed. All the darkness was being pushed back with the glory of God gradually coming through this open portal in the glory. And that tsunami and that tornado went right the way up the country. And then it got up to Scotland. And I could just hear all this roaring going on, and Christians crying out. And then it started to come down again, but as the water was coming back down, so the water was going either side of the UK as well as on the UK. This is the time of wonders, outstanding signs and wonders. England you are coming into a time of amazing wonders, or supernatural phenomena, and miracles. This is going to manifest in an amazing release of glory breaking out all around you, everywhere you go. England this is a year where God is measuring you, amending, changing, renovating, and turning you. God is releasing a new Grace and favour to you, so as to turn around the persuading doubt that has come like a cloud over the nation, God is going to turn impossible situations around, and it will seem even in a day the Nation will turn. Note: See this blog’s Introduction to Prophecy about how to handle prophetic words. This entry was posted in Prophetic, UK and tagged Braker, New Season, Prophecy-today by Richard Barker. Bookmark the permalink. Richard do you recall this dream? A cleansing wind? Somehow I feel that the dream could be related to your posting. I’ve got that nickname from my friends back east when I informed them that I was moving to Tucson. No I don’t mind Richard. It’s the double-T alliteration that does it, my friend – and I’m much further east! Also, you’re aware of my family connection to Tucson. Indeed I am. Green Valley I remember you saying. like new wine, flows afresh, into a cup, that overflows. This song is based on the “And There Shall Be No Ebb…of My Glory” Prophecy heard in 1934 spoken by a youth at his Anglican Church where he served as a Priest. Arthur preached this prophecy for over 60 years in over 60 Countries. And now it is being performed by The Holy Spirit as promised. The Lord told him to declare this tide of The Manifestations of His Glory had begun in August,2014 just before Arthur was promoted to Glory in Heaven. I am a Street Pastor serving with Healing On The Streets Team in Monmouth, S. Wales. I have already seen evidence of prayers being answered for new spare body parts. I am meaning newly regenerated arms and legs. First of these miracles included a man (Adrian Clegg: Testimony on youtube) with crushed knees and snapped tendons in his legs and a lady with no rotator cuff or bone in her lower arm. She came expecting a miracle to our meeting near Stormoway, Isle of Lewis because a prophet at ta meeting in Sunderland told her that after so many failed operations to put in steel parts God was going to re-calcify her arm! After we prayed she went home and the next morning she awoke to discover she had newly re-calcified bones in her left arm when she lifted the covers off herself with her bad arm.. This miracle occurred at a The Mission House, near Stormoway, Isle of Lewis. An earlier prophecy reported here stated that this outpouring of God’s manifested Glory would begin in the most northern parts of Scotland. Praise the Lord and many thanks Mary. Will post these as new post with link to previous ones on Arthur to update visitors to this blog.